Places to see at Pedong: Damsangdugi Fort, the main attraction of Pedong bears evidence to a long racial war between Bhutias and Lepchas. It attributes a historical dimension to Pedong. The remains of the fort in the dark, deep and dense forest are reminiscent of the Lepcha Kingdom. Tinchuley is another appealing and appalling attribute of Kalimpong Hills. Here, the wide valley and deep gorge have prompted adventurous activities like Hang Gliding and Para Gliding for tourists. Dmsang Dzong is reflective of the British history of Pedong. Built in 1690 within a fifteen minute walk from Pedong it witnessed hostility between the local tribes and the troops of the East India Company Co. The Dzong gives you a glimpse into the depth of lush green valleys and of the ski-surpassing height of the Himalayas. Pedong has not only historical value but religious glory as well. Tourists from the Christian Community visit Cross Hill to pay their regard to the Cross. Father Augustine Desgodins placed the cross as a landmark when he was passing through the Nathula Pass in 1882. Nearby Attractions at Pedong: Among the nearby attractions of Pedong, Tinchuley especially deserves to be mentioned. Being 3.5 kilometers away, it is in the shadow of Pedong. It entertains tourists with a panoramic view of the Kassang Valley and the Sikkim Himalayas. The walking trail to Tinchuley is lined with a palette of different flowers on both sides. You can hire a car and drive to the nearby attractions of Pedong. Rikkissum that is also called Rissium is one of them. It is at 6410 feet from sea level and 6 kilometers from Pedong. Tourists are obsessed to catch a breathtaking sight of Rishi Valley in Sikkim from Rikkissum. Ramithey is also located in the neighborhood of Pedong. A way through the deep, dark forest leads to the place. 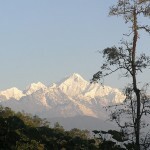 You can soothe your eyes and refresh your mind with a golden glimpse of Kanchenjunga in the sun. Silent valley falls on the way to Rikkissum. A lake was there in the valley. Now the field of cinchona plantation prevails there. Here, you can experience the awesome greenery of the Green Valley. Damsang that is a Bhutanese fort in ruins is a remarkable place to visit. It was constructed in 1837. Father Desgdins had established a Roman Catholic Mission here in 1882. How to reach Pedong: Pedong a hill hamlet is 75 kilometers from Darjeeling and 85 kilometers from both Siliguri and Gangtok. It is only 25 kilometers from Lava and 38 kilometers from Lolegaon. It is located in Kalimpong subdivision and Darjeeling district. Pedong is about only twenty-three kilometers from the place in Kalimpong where Bhutan, Sikkim and West Bengal meet. Its height from sea level is 5100 feet. Best time to visit Pedong: The best season to make a trip to Pedong is from October to March. This time the weather is pleasant. Lodging & Dining facilities at Pedong: Pedong offers mediocre accommodation to its guests and tourists. Hotel service with basic facilities is available at affordable rates. The rate of accommodation in hotels varies from season to season. There are private hotels and Guest Houses. Pedong is lovely. I visited the place twice. I fell in love with Pedong when i saw the terraced fields with green paddy in Kashyone village. Those of you who haven’t visited Pedong must take the 900m walk to the Tin Chuley Hill from where the Nathula Pass and the Jelepla Pass can also be viewed. At Ramitey you can take a vivid view of the Tista flowing between Mt. Kanchenjanga and the valleys. Tourists usually miss many other interesting places like Raniban, Lepcha Heritage, Sangchhen Gumpa, Water Reservoir Rikkisum and the Chyaam dance. Remember to watch these and you will always fall in love with Pedong.